Some two years ago, I heard from Retay Arms about their forthcoming 12 gauge autoloader that was then approaching final development. Now, finally, I have from the BATF the first Masai Mara shotgun ever to be imported into the United States. Apparently, this shotgun is named after the Masai Mara National Reserve, the renowned 580 square mile park in Kenya. 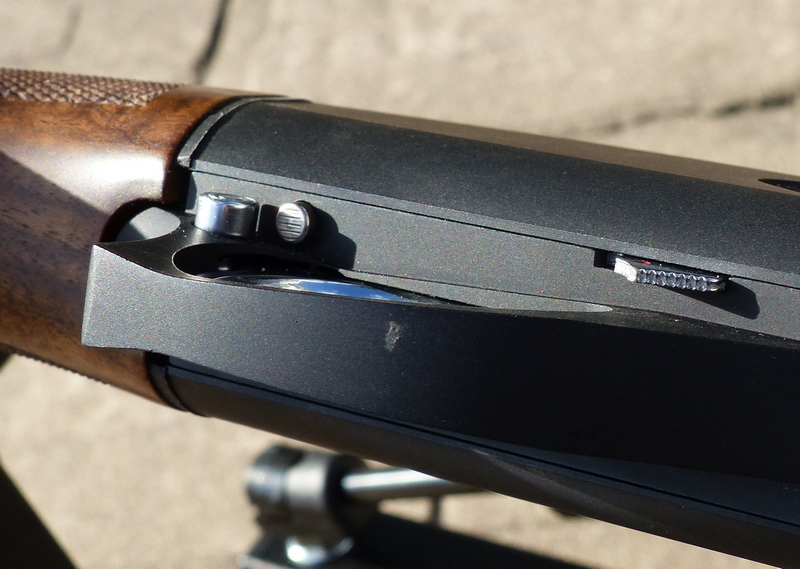 The Masai Mara is Retay Arms re-imagining of the Bruno Civolani inertia shotgun, as popularized by Benelli. The example I have here is the Masai Mara Super Black, also called the "Dark Black," one of at least fifteen models in production at Retay. This is the description of the gun from Retay Arms. Drop at Heel 2.16" ± .04 adjustable to 1.77" - 1.96" - 2.36"
Drop at Comb 1.45" ±.04"
The Masai Mara is not offered as an entry-level shotgun: quite the opposite. Retay Arms feels this is a luxury level inertia gun, a “better Benelli than Benelli.” My example has truly stunning walnut, what several makers would call AA grade. The Masai Mara also goes up against models like the Browning A5 Hunter High Grade, that has an MSRP of $1859.99 and also the Weatherby Element Deluxe (made by ATA) that has an MSRP of $1099.00. The Masai Mara Super Black has an MSRP of $949 as of July, 2017. The tested example has a 26 inch barrel, weighs 6 lbs. 11 oz., and has a trigger that breaks at about 5-1/2 pounds. The Masai Mara comes in a plastic hard case with a snap cap, gun oil, five choke tubes, and a full battery of stock adjustment shims are included as well. Three of the five choke tubes are steel shot rated, the Improved Modified and Full choke tubes are lead-only. Although the "Marachoke" tubes look like Benelli Crio Plus tubes, Crio Plus tubes will not screw in to the tested shotgun: they have a different thread. The Mara has a 5 year warranty. The Masai Mara is extremely easy to load, they have done a very good job here. The MM features a removable ejector: that may be of some benefit, although I've not had any ejector issues with inertia autoloaders. The most remarkable innovation is the tool-less, quick detachable trigger array. Just push a button and the trigger guard swings right out. It works like a charm. The MM has a generous, oversized charging handle on the bolt, and the recoil pad is likewise more generous than on some guns. As far as niggles, the cross-bolt safety button is small: far too small for my tastes. It is odd that with the longer bolt handle and a nicely sized bolt release button Retay Arms got so skimpy with cross-bolt safety. At just under 6-3/4 lbs. as supplied, the Retay M.M. looks to be a good weight for pheasant chasing and a day on the dove field. It is quick to shoulder, nicely balanced, and the walnut stock set is a standout. There is no question that the M.M. is extremely well machined. The wood to metal fit is excellent, the bolt is generously chrome-plated, the action is extremely smooth, and the checkering is cleanly done. At this juncture, most everything is subject to change. It sounds like the target date for availability in the United States is somewhere around the second or third week of August, 2017. As to how well it functions, handles, and feels: that will be covered in Part Two. The Retay Arms website is at http://www.retayarms.com/ .